The family of ATIP proteins (AT2 receptors interacting protein) has been identified for the first time in our lab in 2004, by a yeast two-hybrid system cloning strategy using as a bait the intracellular domain of the AT2 receptor. ATIP1, the leader member of the family, was shown to interact with the AT2 receptor and to mediate its anti-proliferative effects. 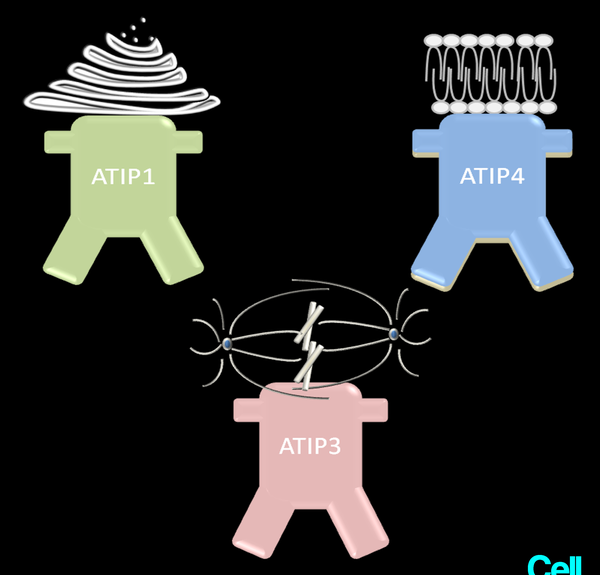 Three major ATIP members designated ATIP1, ATIP3 and ATIP4 are encoded by alternative splicing of a single gene named MTUS1. This gene is located at chromosomal position 8p22, a position frequently deleted in a series of epithelial cancers. MTUS1 expression has been shown to be down-regulated in cancers of different origins, including from the breast, the prostate, the pancreas, the colon, the ovary, the bladder and the head-and-neck, suggesting that MTUS1 may represent a novel tumor suppressor gene. In our lab, we have charaterized the structural organization and expression of the human MTUS1 gene. We have shown that ATIP1 and ATIP3 are ubiquitous whereas expression of ATIP4 is restricted to the brain. The ATIP3 isoform is mutated in hepatocellular carcinomas and down-regulated in breast cancer (see next page). Our collaborative studies have also revealed a role for ATIP1 in cardiovascular homeostasis and neuronal differentiation, as a major mediator of AT2 receptor pathways. Over the past few years, our team has developed all the molecular tools necessary for studying the ATIP proteins molecular structure and function. We are now internationally recognized as leaders in the field.